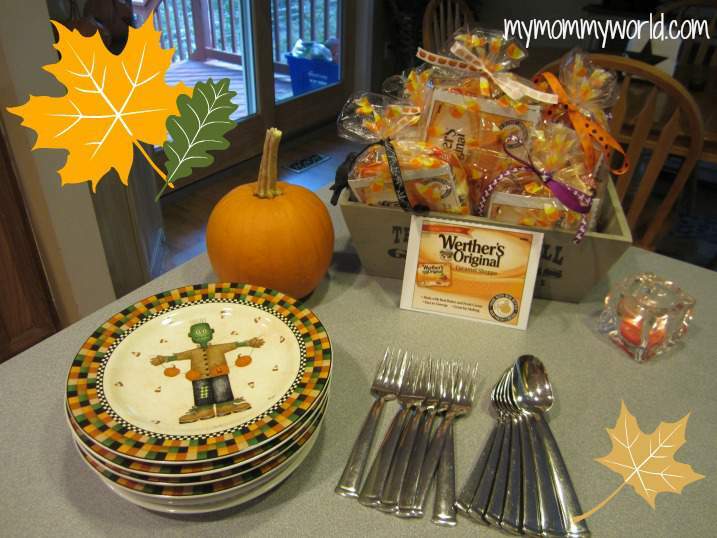 I received free Werther’s Original® products in order to host the Werther’s Original® sponsored MommyParty. The opinions expressed here are my own. I just adore my friends. We are blessed to live in a wonderful neighborhood with many, many friendly people. We hang out at the bus stop, chat while watching the kids play together outside, invite each other to block parties, birthday parties and even hold an annual progressive dinner in which we eat at each other’s houses. My neighbors have grown to become some of my closest friends. I wanted to make my home feel cozy, warm and inviting for my friends, so I started out by decorating a bit. After giving the room a good vacuuming, I placed tiny, flickering candles around, and started some soft music. In the kitchen, I pulled out my new Debbie Mumm Fall-themed dessert plates and mugs to place near the coffee pot. The folks at MommyParties™ and Werther’s Original® sent me a few bags of the new Werther’s Baking Caramels to give to my friends, so I placed them in some pretty cellophane bags and tied them with ribbon to make pretty party favors for my guests. Prepare brownie mix and bake as directed on box. Allow to cool for 10 minutes. Heat the caramels and water in the microwave until melted, making sure to stir every 30 seconds to prevent from burning. Stir in the vanilla extract after the caramels are completely melted. Pour the caramel over the top of the partially-cooled brownies in a swirl pattern, or cover completely. After the brownies and caramel are completely cool, cut into squares and enjoy! To go along with the brownies, I brewed a pot of coffee and put out some herbal and regular teas and caramel hot chocolate. One friend brought over some homemade Butter Pecan Ice Cream (yum! ), and we also had some quiche and chips and dip for those who wanted something salty instead of sweet. The best part of a Mom’s Night Out: Talking! After several hours of talking, laughing and commiserating, the ladies left with full bellies and souls, our friendships strengthened. We also felt a bit of renewal…a bit of time away from homes and kids gave us enough rest to power through another weekend of soccer, karate, birthday parties and more. 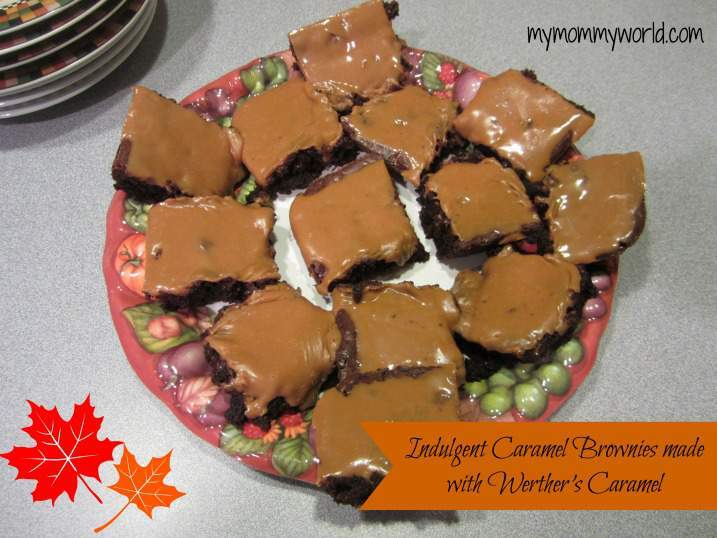 It was a great time sharing indulgent treats and stories…there were only a few caramel brownies left…and we ended the night with the promise of another Mom’s Night Out next month. 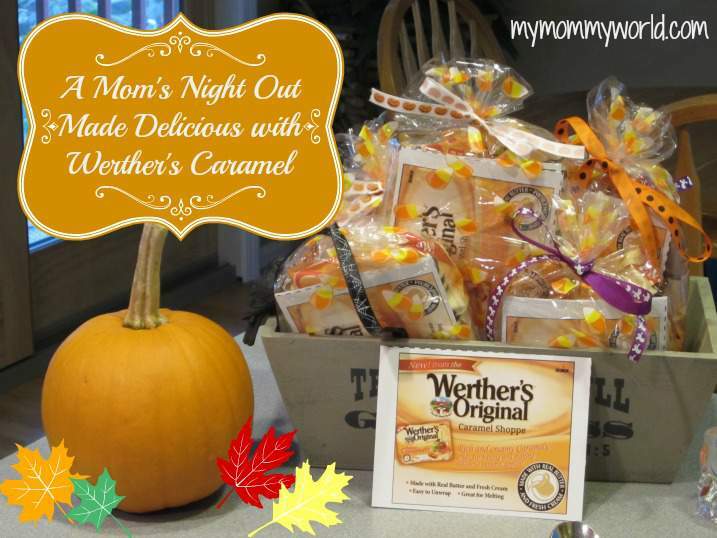 I’d like to invite you to head over to the Werther’s Original® site to find more information for your own Mom’s Night Out! You’ll want to check out some of the other yummy-looking recipes (Homemade Samoas anyone?) and coupons so that you can save on the new Werther’s Original Baking Caramels for yourself. Have you been to a Mom’s Night Out party recently? What is your favorite way to connect with your friends? I went to a Mom’s Night Out party earlier this year, and it was so much fun. I loved the opportunity to get away and enjoy good food and conversation. 🙂 Thanks for sharing about your mom’s night out, Erin, and I’m sorry to hear about how the shutdown affected your family. Thank you so much Sandra! It was hard not knowing when you would be allowed to work so that you can pay your mortgage.